Hi! My name is Will, and I like telling big stories using small figures (this is the part where you excitedly say "Hi, Will! ", as if we are in A.A.). To me, there's more reality and humanity in the anecdotes and lives of regular people than there are in the Kardashian's and Kanye's of the world. You see, my Gran'pa was always there for me when I was young. He would drive me to the library (sitting on two phone books, nonetheless), and sit in the car while I browsed for hours. He was present at my high school and college graduation. He was always there to knock some sense in me whenever he felt I wasn't 'doing the right thing', encouraging me to 'go straight ahead!' Now, he lives all alone, watching his gospel shows and lighting his prayer candles; even Gran'ma doesn't talk to him! I wanted to create "Gran'pa Knows Best" because it enables me to examine into who I am and where I came from, and preserve a bit of my Puerto Rican culture. It allows my grandfather to feel needed again. He's now able to provide advice for ALL young people, not just his grandchildren. He's 86, and you just never know how much time you have to capture your elders before they're gone forever. All it took was the perfect creative team for the idea to become a reality. We have all toiled for two years to make this project a reality, and I hope you will all take a moment to learn about each of them. These folks means the world to me! Upon viewing William's short film HOW YOU DOIN’ BOY? VOICEMAILS FROM GRANPA, I knew I wanted to connect with this filmmaker. While the character, dialogue and honesty was fulfilling in this well-told story, it was the art of the project that was amongst the most creative I have seen in film, that made me need to hop on board and become a team member in the creation of the series. As a previous web series creator, writer and producer, I knew well the intricacies of web series, social media marketing, copyright, trademark and licensing, and I knew exactly who I wanted to show it to for acquisition. When I'm not producing Gran'pa, I run my own production and talent casting studio, Del Valle Productions, Inc./Del Valle Casting. I am a WGA-East writer, DG Playwright, Casting Producer, SAG-AFTRA signatory producer and a Performer most noted for my autobiographical off Broadway one person play, Brownsville Bred. I was born in South Korea, went to Sejong University (BFA, painting) and now live in Queens, New York. I was attracted to the project when I met with William and found out that one of his short films made it to the Slamdance Film Festival. Anyways, I'm the one who created every single pose of Gran'pa using a few reference photos in the program ZBrush. I think this means that I know Gran'pa very well! I'm from Massachusetts and went to Pratt Institute (BFA, Industrial Design) with my fraternity brother Will. When I found out that he was in need of a 3D printing specialist, I gave him a ring. Each of the characters were printed in polymer resin. I also created Gran'pa's kitchen, and 3D modeled all of the furniture. When I'm not helping Will on his projects, I work full-time at an architecture firm in NYC. I'm an animator currently working at an ad agency in New York City. I also helped with some of the graphic assets for the Gran'pa Knows Best web series and made the 2D animated text overlay for the original How You Doin' Boy short film. When I'm not animating stuff, I like to make puns and eat $5 Vietnamese sandwiches. I believe Gran'pa does, in fact, know best, and treasures the wisdom he imparts to the YouTube generation. I was born and raised in Kaneohe, Hawaii, moved to New York in 2009 and graduated from New York University in 2013 with a baccalaureate in music education. I worked with Will as a musician on his project SPEAK! So the World Will Listen! Uganda, as well as a prop maker for his award-winning short film, Seed Story. I currently teach music at a high school in Manhattan, while continuing to perform as a musician and paint miniatures for Gran'pa. Behind every great man, there's a great woman. I'm married to the director, and have seen this project grow from an idea into a web-series over the past two years. I've been there for him throughout all the stress and moments of self-doubt, offering my support for him in just about every aspect of the project. I work full-time at an organization dedicated to eradicating modern day slavery and am working on opening up my own non-profit later this year. Will is my cousin. I help him out on his films and he buys me Portuguese BBQ. I also weld. 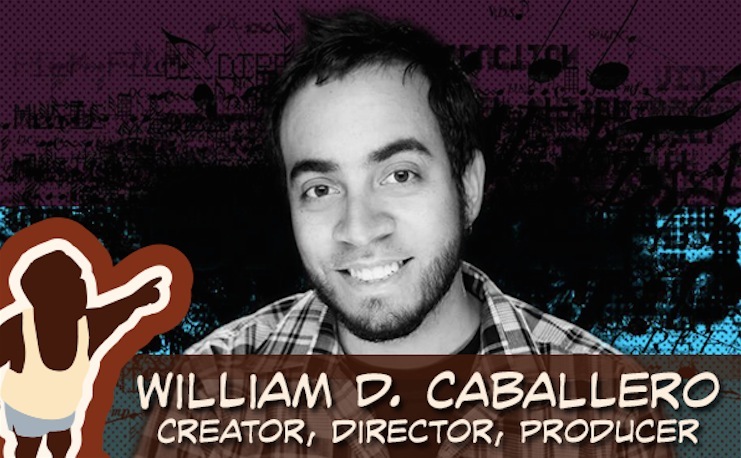 William D. Caballero's next short film project (the "Gran'ma & Gran'pa" shorts, coming Fall 2015) is supported in part by the National Association of Latino Arts and Cultures, the Ford Foundation, and the Surdna Foundation through a grant from the NALAC Fund for the Arts Grant Program. NALIP has been instrumental in the promotion of Gran'pa, helping it reach wide audiences and gain exposure.